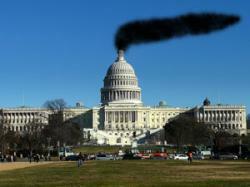 Climate politics: Congressman parrots climate change denial errors. Man, sometimes I hate it when I’m right. This whole week I’ve been writing about how an article in the tabloid newspaper The Mail on Sunday is riddled with climate change denial nonsense, with error piled upon error. They even updated the atrocious article, making it in some ways worse—the basic mistake about temperatures increasing upon which the article was based was changed, but not corrected. I also posted about how misinformation like this spreads through the deny-o-sphere, going from one mouthpiece to the next, changing and morphing into even more ridiculous claims. I pointed out that this kind of bilge eventually makes its way to people who have actual power. But here’s the reality of temperature changes over the last 40 years… Actually we can say over 40 years there’s been almost no increase in temperature – very slight – in fact […] even with increased greenhouse CO2 level emissions, the Arctic ice has actually increased by 60 percent. Also that the Antarctica is also expanding… most experts believe by 2083, in 70 years, the benefits of climate change will still outweigh the harm. Let me be clear: What he said here is complete nonsense. To start with, his claim that temperatures haven’t gone up in 40 years is just dead wrong. I think he was trying to talk about the flattening of temperatures over the past few years that deniers are making so much hay out of. At best, this leveling out of surface temperatures goes back 15 years or so, but certainly not 40. I might forgive the Congressman and say it was a slip of the tongue, but he says it more than once. Temperatures are rsising, despite the claims of Rep. McKinley. 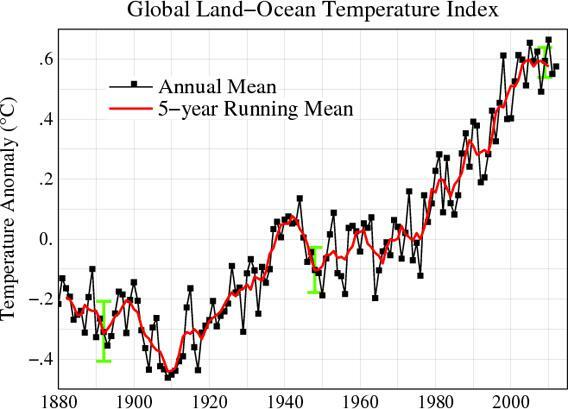 The reality is that since 1973 land surface temperatures have gone up a full 0.6° C in a trend so clear it’s hard to believe anyone could honestly miss it. And as I have pointed out, the recent flattening is only due to a downswing in ocean temperatures due to a natural and well-known cycle in the Pacific. 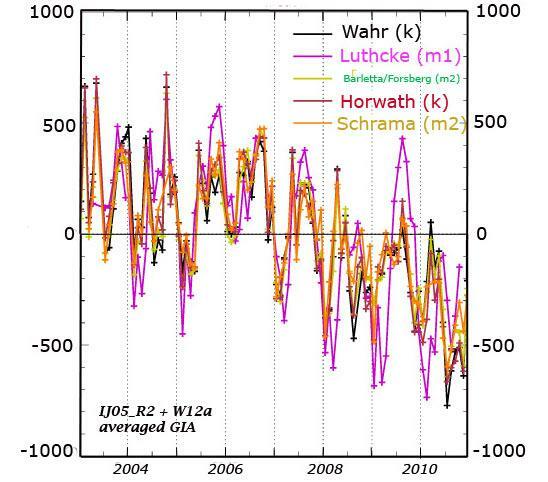 Once that goes back to an upswing, land temperatures will increase once again as well. Also, McKinley propagates the Mail’s grossly misleading claim about Arctic sea ice increasing. Last year at this time we had a record low extent of sea ice over the North Pole. This year, the ice is way, way below average, by about a million square kilometers. Sure, it’s more than last year, but that’s only because last year’s minimum was extremely low. It’s incredibly misleading to say this year’s ice recovered from that. It’s far more fair to note that this minimum is one of the lowest ever seen (the sixth lowest since satellite measurements began, and possibly for millennia). His claim that Antarctica is “expanding” is also baloney. It’s an old denier trope, and doesn’t differentiate between sea ice and land ice. The sea ice around Antarctica grows every winter, and melts away every summer. 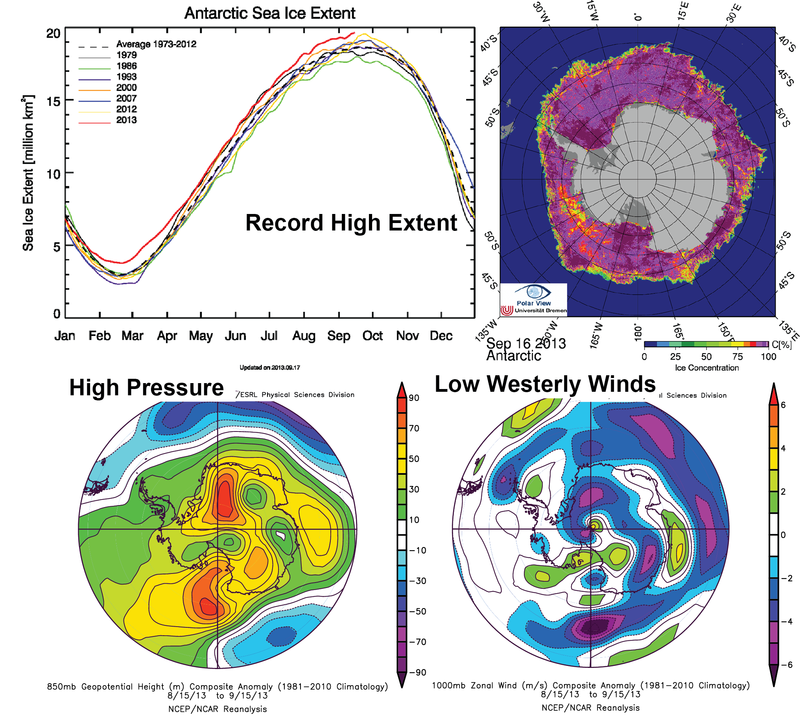 Right now it’s winter in Antarctica, and sure enough the sea ice is at a maximum. In fact, it is at a record max: about 4% higher above the previous maximum. But this will all melt away again in the austral summer; it doesn’t really have any long-term implications for global warming (although a case can be made that warming means more moisture in the air, which can then snow out when it’s cold, ironically temporarily increasing ice extent). And note that this is happening when Arctic sea ice extent is still 30% below average. And what of Antarctic land ice? Surprise: That’s decreasing over time, to the tune of about a hundred billion tons per year. Monthly ice mass change in the Antarctic, measured in billions of tons (normalized to 0 in 2007). The average annual drop is roughly 100 billion tons per year. Finally, about McKinley’s claims that most experts think climate change will have more benefits than harm: I will be very, very surprised—shocked, floored even—if that turns out to be the case. I have not read the full IPCC report (it’s still not released), but I’ve read a draft of the “Summary for Policymakers” and did not see any mention of this (to be fair, I might have missed it, but the SfP goes over specific topics like temperatures, history, and so on). But I have to wonder what “experts” would say such a thing. Most of the climate and environmental scientists I have read say that global warming on the scale and rate we’re seeing is catastrophic; only full-blown climate change deniers have made any claims that the benefits outweigh the harm. So there you have it: A duly-elected Representative from West Virginia sits on the House Subcommittee for Energy and Power, and can make easily-disproven and frankly ridiculous statements like that, empowered by the kind of error-riddled articles published by the likes of The Mail, just as I warned. I was glad to see Rep. Henry Waxman (D-Calif.) call McKinley out on his statements at the end of that video excerpt, and make a clear call for more science and scientists at hearings like this. But as long as Republicans hold a majority in the House I despair of that happening; they tend to call well-known deniers to testify at these panels, and the sitting Congresspeople on those committees are overwhelmingly anti-science. This matters, folks. This is our future we’re talking about, and from top to bottom, people who flatly deny reality have infiltrated the system, with just enough influence to obstruct any real progress. This must change if we’re ever to fix this looming and globally critical problem.